Author's note: I have started to build this model as way to visualize learning in the 21st century. 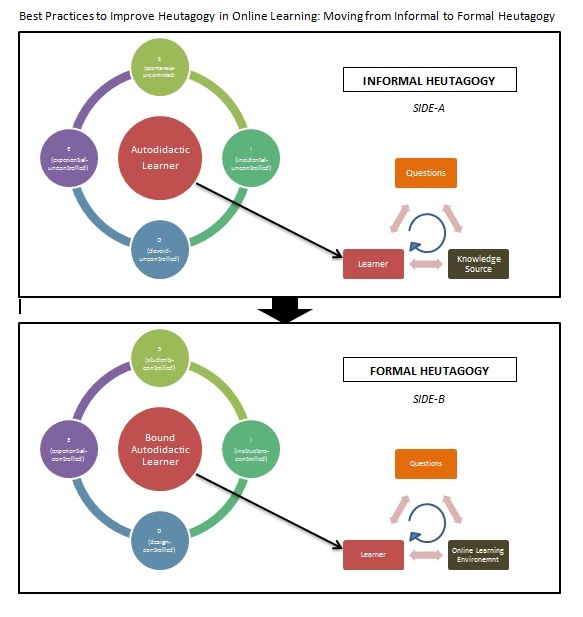 Informal heutagogy is the process of learning via technology outside the classroom. When we have a question internally, we often turn to our mobile phones for quick-fix answers using Google search, IMDB, or Wikipedia; and every individual is unique to how they locate answers and manage digital tools. Given this scenario, there are a lot of uncontrollable factors to consider; however, learning is still taking place in a much more rapid way then ever before. Formal heutagogy presents a scenario that harnesses this action into the context of online classrooms; wherein, the digital tool is the online classroom or LMS. Learners ask questions in the same individualist manner; however, the environment is controlled and essential acts as an incubator to the process of self-determined learning.